Hard water is harsh on all dishes, including cutlery. Thankfully, there is a simple solution for effectively cleaning your cutlery and removing the black stains that hard water can cause on certain metallic surfaces. Best of all, you can create the cleaning solution with things already in your pantry. So pull that cutlery out of the drawer and get ready to make it shine. Make your cutlery shine like new again with some household cleaning agents. Combine 1/4 cup of chlorine bleach and 1/4 cup of liquid water softener with 1 gallon of boiling water in a sink. 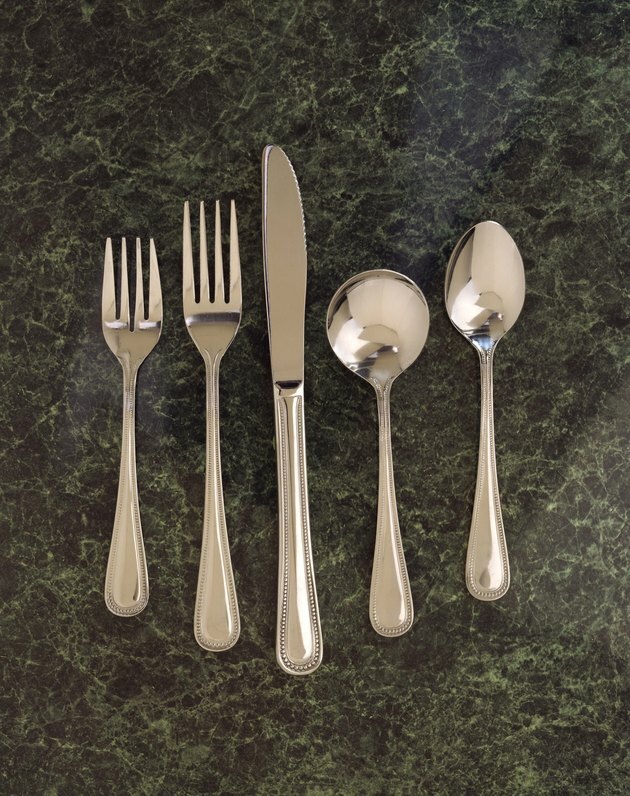 The bleach and water softener dissolve the mineral buildup on the utensils, bringing back the original shine. Carefully place your cutlery in the sink and let it soak for 30 minutes. Drain and hand-dry. Remove remaining black spots with non-gel toothpaste and enough ammonia to make it the consistency of pancake batter. Spread the mixture on the spots and let it sit for 10 minutes, then wash and hand-dry.